Valador recently submitted an entry into the well-respected Business Intelligence Journal, which is considered by many to be the pre-eminent venue for all things BI and analytics for the last 20 years. Valador’s submission, titled “How a New Administration May Impact my Business?”, focuses on the inevitable changes that occur in various types of businesses and organizations, when a new governing administration takes over; additionally, the paper proposes and provides a streamlined and systematic methodology to objectively view a business’ structure and components, and make adjustments as necessary in order to adapt to these changes as quickly as possible. The paper describes in detail the value and importance of analysis, and use of Business Intelligence tools and mapping the business components against the possible policy changes from the new administration, and ways to use graphical ways of visualizing the alignment of the Policies/Political Factors that may impact the Business Metrics or Key Performance Indicators (KPIs). 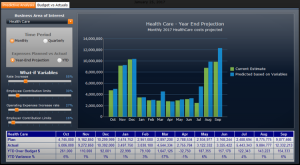 Valador’s paper also provides BI dashboard examples that are ideal for gathering large amounts of data, and presenting them in a concise and user-friendly manner, while also allowing for integration into other technical methodologies and tools, such as Modeling and Simulation (M&S) and other types of predictive analysis methods. Valador is excited to be included in the Journal, scheduled for a September 2017 edition release.